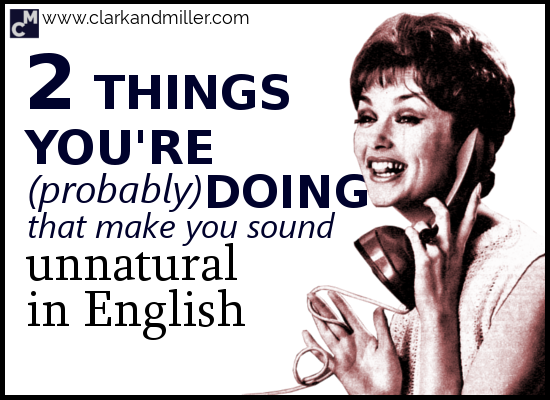 Today, you’re going to learn how to fix 2 unnatural mistakes you’re (probably) making in English. Also check out 4 Simple Changes to Make You Sound More Fluent in English. Learning a language is about more than just the grammar and vocabulary, right? Today, I’m going to give you two simple little hacks that can make you sound more natural in English. They’ll also make your English more efficient. Repetition is (usually) not your friend. Why does Ranjit want a traffic cone? Find out here. So much repetition — repetition of both nouns (“Karen” and “traffic cone”) and repetition of verbs, too (“take a traffic cone”/“took a traffic cone”). We’ll come back to this story at the end of the post, but first, let’s look at the simple ways we can stop repeating ourselves! 1. Are you repeating verbs? Instead of repeating a verb (or a verb phrase), you can replace it with the auxiliary verb. What’s an auxiliary verb? Click here. In any sentence with a verb in it, the auxiliary is between the subject and the verb. He’s eating giraffe soup again. I live here. — I (do) live here. She met him at an elephant factory. — She (did) meet him at an elephant factory. Is he eating giraffe soup again? Have they even looked at the report? Did she meet him at an elephant factory? Much cleaner (and more natural), isn’t it? Using the auxiliary like this may seem very simple, but that’s the beauty of it. We can remove sooooo many words and still understand what’s happening. It’s like we’re speaking in code — special expert English-speaker code. 2. Are you repeating nouns? Nouns are actually a little trickier than verbs because there are different kinds of nouns. But this is a bit of a boring, technical way of looking at it. Alec and Tina are working on a massive project. They need lots of things to make the project work. Sometimes what they need is countable, sometimes uncountable, sometimes they just need one thing, sometimes they need a lot of them. Sometimes it’s a specific thing that they need and sometimes it doesn’t matter which one. As long as they have one. Like I said, it’s a massive project. I know this is, in a way, quite simple stuff. But as I said, I regularly hear advanced English learners make these kinds of mistakes. So, remember this paragraph from the beginning of the post? Make Karen’s story more natural! Write your answer in the comments. I’d love to see how you do. ⟵Do You Know These 8 Very British Idioms? I was outside with my friend Karen. He showed me her traffic cone. I was like, “Yeah, that’s a nice one. Where can I get one?” And Karen said that there were some next to the police station and that I should just go and take one, just like she took one the day before. Almost perfect — good work! Otherwise — perfect! Nice one! I was outside with my friend Karen. She showed me her traffic cone. I was like: “Yeah, That’s a nice traffic cone. Where can I get one?” She said (that) there were some next to the police station and that I should just go and take one, just like she did the day before. What about my “naturalization”? Your naturalization is perfect! Nice one! I was outside with my friend Karen. Karen showed me her traffic cone. I was like, “Yeah, that’s nice t. Where can I get it?” And Karen said that there were some next to the police station and that I should just go and take one, just like she took one the day before. 2. “Yeah, that’s a nice one/traffic cone. Where can I get one?” — remember — Ranjit isn’t thinking of a specific traffic cone. Any traffic cone is enough! Ooohhh… I like it. A bit different. I was outside with my friend Karen. She showed me her traffic cone. I was like, “Yeah, that’s a nice one. Where can I get it?” And she said that there were some next to the police station and that I should just go and take it, just like she did a day before. Awesome — so close to perfect. Just one error: “”…that’s a nice one. Where can I get one?” — remember Ranjit’s still not interested in a specific cone. Any cone will work for him! Nice one Brenda — spot on! Love this Gabriel. I actually think some teachers are at fault here for forcing students to make complete sentences even though it sounds “unnatural”. I haven’t decided if I’m including myself in that – I possibly have at times! 2 questions – what were you drinking before the phone rang? Was there someone on the end of the line and what were they asking you about? They sound pushy! Haha! Good questions. I’ll answer those first. I was drinking black tea I think. Tea is awesome. I’ll leave it to your imagination to guess what they were talking about. But it was based on a certain British sitcom from the 70s. Set in a hotel. In Torquay. With John Cleese in it. And a Spanish waiter. But I say no more on that. And yes… I think we’ve all been guilty of correcting students who use complete sentences instead of just letting it sound natural. I guess it begs the question: are they doing it for the right reasons? I mean the whole “you’ve gotta know the rules to break them” thing. Interesting area, but at least learners should be made aware of the phenomenon. Hence this post! I was outside with my friend Karen. she showed me her traffic cone. I was like,”“Yeah, that’s a nice one. Where can I get one?” she said that there were some next to the police station and that I should just go and take one, just like she did the day before.